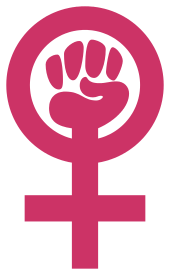 Gender feminism is a term used in relation to other forms of feminism. According to Wendy McElroy and Christina Hoff Sommers, gender or political feminism is defined in opposition to individualist feminism. The term was used especially in the early 1990s to refer to some different concepts. It has been used to distinguish perceived radical feminism in comparison to liberal feminism. It has also been used in relation to some feminists' arguments about gendering and other topics: that all cognition is gendered and that all knowledge is gendered. A category of anti-gender feminism has also been described. 1 2 Yates, Steven (October 1992). "Multiculturalism and Epistemology". Public Affairs Quarterly Vol. 6, No. 4. pp. 435–456. JSTOR 40435825. (subscription required (help)). Feminists offer their distinctive twist to this approach by saying that all knowledge and cognition are "gendered"; hence the term gender feminism. 1 2 Sandoval, Chéla (1994). "Re-entering cyberspace: sciences of resistance". Dispositio Vol. 19, No. 46, Subaltern studies in the Americas. pp. 75–93. JSTOR 41491506. (subscription required (help)). Under this new form of what Haraway calls "anti-racist," indeed, this is even an anti-gender feminism, she asserts, "there is no place for women," only "geometries of difference and contradiction crucial to women's cyborg identities" (Haraway 1991, 171).